Just a quick li’l post thanking deerhound family around the globe for posting enquires as to where some of the locations, images and artworks can be found. The image below and the image from the previous post are available from Corsini - simply click the link. They have a variety of deerhound artworks and sculpture which can be found through their index. Why not pay them a visit? Eventually I will get around to including a ‘Links’ column in this blog, which I promised to do some time ago. The Rogue will link to any site that chooses to link to this blog - and as I have no commercial affiliation, I will be free to indulge in my usual Scottish hound enlightenment. 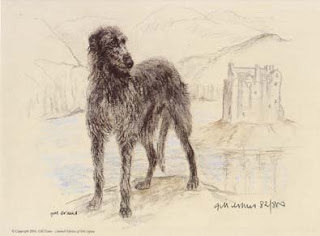 And in an enlightening mode, it’s interesting to observe in the ‘Deerhound by Gill Evans’ painting below, one of the most famous and picturesque of Scottish Castles: Eilean Donan. Used in many movies and featured on an abundance of Scottish product packaging, find out more about the castle by following the link or even better visit the highlands and drop in personally. Now I wonder if the subject was painted on location and which member of our family this hound is? What do you mean we ain’t s’posed to sleep up on the suite? Last year, 2006, was the International year of the Dog. And to celebrate, Christmas Island knew which DOG to choose for one of their Souvenir Cover, limited edition postcards. If you are reading this on deerhounds.blogspot.com it won’t require assistance from that greatest of Scottish created sleuths, ‘Sherlock Holmes’ to aid you in the quest for an answer. (Check out the Links within the Sherlock Holmes titles, if you wish to investigate the Sherlock Holmes history or obtain a little general information or even read all of Conan Doyles’ ‘Sherlock Holmes’ published works. To make it more fun, you may have to Sleuth around this posting yourself for a wealth of Sherlockana. You should find at least six related weblinks). Meanwhile, enjoy the reproduction of the aforementioned Deerhound postcard above. Onto this year, and here we are, one half of the way through Highland 2007. A’ bhliadhna a chomharraicheas Alba cultar na Gaidhealtachd. If ever a Deerhound wished to visit it’s natural heritage by byrth this would be the time . . . The year Scotland celebrates highland culture. Check out the events website link for details of what’s on and what’s happening and come visit. There are plenty o’ us bonnie deerhound family members to keep ye richt and plenty o’ Deerhound historic and artistic sites to visit. Failte gu Gaidhealtachd na h-Alba. When viewing this little Deerhound portrait, it immediately put me in mind of the works of Edvard Munch. You know . . . the dabbler who painted that ‘Scream’ painting. 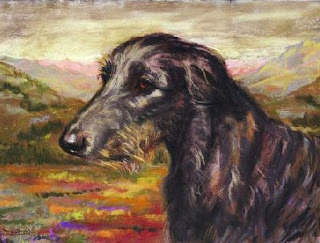 Only, I personally feel, had the artist captured a deerhound - it would have been similar to the image above. Much less anxious, much less paranoic, much more - ‘deerhounds are way cooler than humans as art subjects’ for sure. 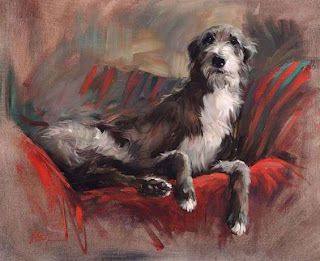 Appologies to the artist of the deerhound rendering featured in this post, for I know not who they are. Perhaps some one can enlighten the Rogue. I do feel deerhounds and their human companions everywhere, will enjoy the art - and for the 21st Century Schizoids - they can rootle aroond in here if they wish to enjoy more of the works of Edvard. For deerhound history fans everwhere - here is an interesting little selection of art related to a location in Glenfeshie not far from the town of Aviemore in the Grampian Mountains of Scotland. 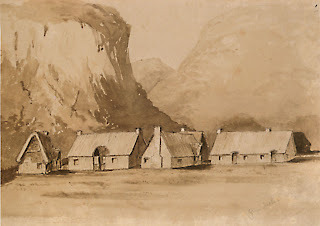 The sepia coloured work of art is entitled "The Huts of Glenfeshie" and was painted by an unknown artist. If you click on the link, you will find a structure still in existence - possibly rebuilt from one of the buildings in this vincinity which is available as a holiday (vacation) let. 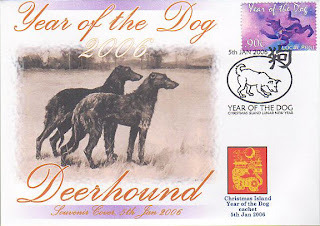 What in the name of deerhounds has that got to do with us deerhounds? Well as you know, the highlands are a natural home to we auld hounds and Glenfeshie has seen it’s share. In the other works of art featured here, you may notice the hounds quite prominent in the renderings. From approximately 1833 these are hounds featured in hunts hosted by The Duchess of Bedford who rather than go into lenghty histories of, click the link and read the wikipedia entry then piece it all together yourself. The afternoon Tea tale is a delight. The Duchess had these huts constructed for a spot of deer hunting, and who better to accompany than we hounds. These glen huts of the Victorian period were rather rough and purported to be of genuine highland living style. A comic actor of the period Charles James Mathews likened these to an Indian Settlement or a poorer type of peasant cottage. Queen Victoria on the other hand coming upon these huts much later in the 1850’s recorded - ‘Then we came upon a most lovely spot . . . 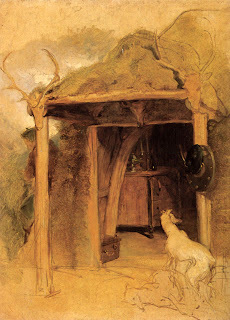 The Landseer exterior hut painting above, featuring the deerhead trophies with antlers over the entrance, can be viewed at the Philidelpia Museum of Art. The black and white sketch is from a private collection. 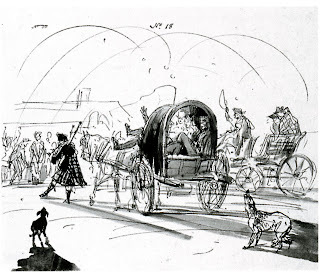 This depicts the Duchess arriving at the Glenfeshie Ball - piped in by a highland piper and followed by a pair of howling hounds. I fear for the covered wagon driver tho, what’s happening there? - A touch too much of the highland whisky and an early example of the drink driving dangers ha! ha! Another little window into the deerhound in Scotlands history for all to enjoy.